In wheat, water deficit during meiosis of pollen mother cells greatly reduces seed set and grain number. A promising option to avoid grain losses and maintain wheat productivity under water stress is to exploit conservative water-use strategies during reproduction. In this work, two cultivars known to be adapted to different environments were studied. Water stress, with or without a polymer spray known to reduce stomatal conductance, was applied to both cultivars just prior to meiosis. Two experiments were carried out in a phenotyping platform to (1) assess and validate daily non-destructive estimation of projected leaf area and to (2) evaluate different water-use (WU) strategies across the meiotic period and their effect on physiology and yield components. Gladius displays an elevated breakpoint (BP) in the regression of WU against fraction of transpirable soil water (FTSW) for both daily and night-time WU suggesting higher conservative whole-plant response when compared to Paragon. At the same time, Gladius maintained flag leaf gas-exchange with a significant reduction at ~ 0.2 FTSW only, suggesting an uncoupled mechanism of WU reduction that optimized the water resource available for flag leaf gas-exchange maintenance. Under progressive soil drying, seed set and grain number of tillers stressed at GS41 were significantly reduced in Paragon (p < 0.05) thus leading to lower grain yield and grain number at plant level than Gladius. 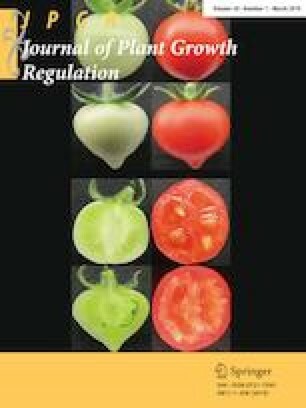 Polymer-induced reduction of transpiration is potentially useful when applied to the non-conservative stressed Paragon, maintaining higher FTSW, water-use efficiency and RWC during the progressive soil drying treatment. This led to better seed set (p < 0.05) and grain number maintenance (p < 0.05) than in the stressed Paragon control. We conclude that the different conservative traits detected in this work, protect grain development around meiosis and therefore maintain grain number under water-limiting conditions. Additionally, non-conservative genotypes (often with a greater expected yield potential) can be protected at key stages by reducing their water use with a polymer spray. Thus, future efforts can integrate both crop breeding and management strategies to achieve drought-resilience during the early reproductive phase in wheat and potentially other cereals. The online version of this article ( https://doi.org/10.1007/s00344-019-09956-3) contains supplementary material, which is available to authorized users. We thank Richard Webster for the use of the gas-exchange system and Alan Gay for the useful discussion of the manuscript. Minuka Weerasinghe and Kelly Racette are acknowledged for their precious help during harvest and yield components analysis. The work was funded in part through the National Capability for Crop Phenotyping Grant references BB/J004464/1 and BB/CCG1730/1 and through the ERA-CAPs consortium Modcarbostress Grant reference BB/M018407/1.